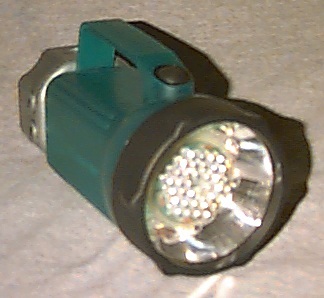 After successful try-out of a 9-LED flashlight conversion described previously, It was decided to try a 36-LED design based on a 6 volt lantern-style flashlight. NOTE: the project was comleted in 2003. In 2010, one string of LEDs failed to light, due to an open resistor in series with them. In 2012, the flashlight was sadly ruined by having gasoline preservative unknowingly spilled into it, and this remaining for several months. Otherwise, it would still be in use today. The other light, with 9 LEDs, still functions but the two 2.2V SLA cells have gone bad and it's really not worth the cost to repair it, although with those cells a 1 Watt LED with a small switching type LED driver IC from STMicroelectronics would be an interesting and efficiency-improving upgrade, handling up to 5 A of LED current for those wanting a much brighter light. I prefer an extra-long battery life because it was a 24-hour emergency light for me. In any case, the available ICs current can be set from nearly zero to full via a variable resistance, so they are really versatile without losing any efficiency and the light would last a long time with the current set low.